This week, we're celebrating World Space Week (#WSW16). Today we're focussing on our Space for Smarter Government Programme. SSGP is an exciting and challenging programme operating to educate and inspire public sector to the multiple uses of satellite applications and data as well as dispel the myths that space is too costly, too technical too difficult to understand. 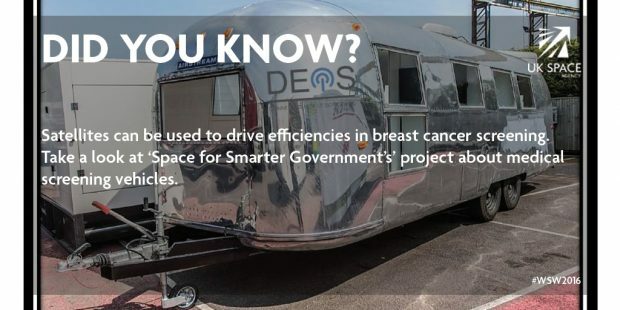 For 25 years, mobile breast screening vans have operated without connectivity, resulting in all the associated consequences in terms of efficiency, flexibility and accuracy. This project set out to assess and develop the potential for a commercially viable service that would automatically move medical images from screening vans directly back to HQ PACS; provide live and dynamic access to appointment systems; enable live and dynamic access to key software applications; and eventually lead to the removal of antiquated paper-based systems. The project enabled extensive research of the market needs and the full development of a new service infrastructure to deliver the service to meet them. The project also enabled the creation of a new demonstrator vehicle which will be used to demonstrate the service and quantify its benefits for users. The service has been commercially adopted on six vans and two trusts are moving towards fully paperless working on their vans. The project developed a fully managed service to move images from mobile screening vans back to HQ PACS via Satellite. The service is being used commercially on six vans and two Trusts are already moving toward paperless working. The project team worked initially with providers of NHS Breast Screening services but are now extending to other medical programmes i.e. MRI screening. Some of the lessons learned throughout the process include that cultural change to long established working practices can be much harder to achieve than the development of the technical solution and service development. A fully managed service can be provided for less than £700 per van per month or the entire National Breast Screening Programme can be transformed for less than £750k per year. All capabilities required to work with this service already exist within almost every screening Trust, but the change in working methods requires a shift in culture. The service should be fully financed by efficiency gains and logistical savings whilst delivering better data security, greater flexibility, better working environment and a better patient experience. The most urgent step for the project is now to gain critical mass as quickly as possible. Once the project has achieved this, it can complete the nationwide roll out to breast screening, extend its work with other UK screening programmes, and develop the potential to export the service to Europe.